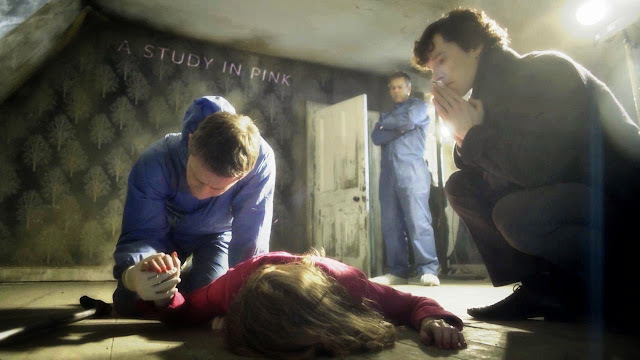 "A Study in Pink" is the first episode of the television series Sherlock and first broadcast on BBC One and BBC HD on 25 July 2010. It introduces the main characters and resolves a murder mystery. It is loosely based upon the first Sherlock Holmes novel, A Study in Scarlet. The episode was written by Steven Moffat, who co-created the series. It was originally filmed as a 60-minute pilot for Sherlock, directed by Coky Giedroyc. However, the BBC decided not to transmit the pilot, but instead commissioned a series of three 90-minute episodes. The story was refilmed, this time directed by Paul McGuigan. The British Board of Film Classification has rated the pilot as a 12 certificate (not suitable for children under 12) for video and online exhibition, and it is included as an additional feature on the DVD released on 30 August 2010. John Watson (Martin Freeman), an Army doctor injured in Afghanistan, meets Sherlock Holmes (Benedict Cumberbatch) who is looking for a flatmate to share a flat at 221B Baker Street, owned by landlady Mrs. Hudson (Una Stubbs). The police, led by Detective Inspector Lestrade (Rupert Graves), have been baffled by a strange series of deaths, which he can only describe as "serial suicides". Sherlock looks at the latest crime scene, of a woman named Jennifer Wilson who was dressed in pink. Sherlock deduces Wilson was a serial adulterer in an unhappy marriage. Unlike other victims, she left a note, clawing "Rache" into the floor. Sherlock ignores forensic expert Anderson's, suggestion that it's German for "revenge" and reckons the victim died before finishing to write "Rachel". Sherlock finds splashes of mud on her leg, thrown up by the wheel of a suitcase, and deduces she's from out of town. The police found no suitcase with the body, but Sherlock searches for it later, finding it abandoned nearby. Meanwhile, John receives a call in a telephone box and is taken to an empty warehouse, where he meets a man who claims to be Sherlock's "arch-enemy". He offers him money to spy on Sherlock, but John refuses. The man also tells John that far from suffering from post-traumatic stress disorder as his therapist believes, he actually misses the war. When John returns to 221B, Sherlock asks him to send a text message to Wilson's still-missing phone, hoping the murderer will make a move. While waiting at a local restaurant, Sherlock notices a cab and gives chase, using his extensive knowledge of London's streets and alleys, to outpace it on foot. However, when they finally stop the cab, the passenger is a tourist from the U.S. who has just arrived in England: a perfect alibi. Believing Sherlock withheld evidence, Lestrade executes a drugs bust as an excuse to search his flat. Sherlock presumes "Rachel" was Wilson's e-mail password and the victim planted her phone on the killer so he could be traced by GPS. At the same time John finds the signal is coming from 221B, Mrs. Hudson tells Sherlock a taxi is waiting for him. Outside, the cabbie (Phil Davis) confesses to the killings, but proclaims he merely speaks to his victims and they kill themselves. He challenges Sherlock to solve his puzzle, and later, inside a quiet college building, the cabbie pulls out two bottles, each containing an identical pill. He says one of the pills is harmless, the other poison; he invites his victims to choose one, promising he will swallow the other — and he will simply shoot them if they refuse. Sherlock soon deduces the cabbie is an estranged father who was told 3 years earlier he was dying. The cabbie admits that a "fan" of Sherlock's contacted him and offered to "sponsor" his work, paying money for each murder, to be left to the cabbie's children. Sherlock realises the gun is actually a novelty cigarette lighter and starts to leave. However, the cabbie challenges him again to choose a pill and see if he can solve the puzzle. Meanwhile, John traced the GPS signal from the phone and followed Sherlock. Through a window in the adjacent building he shoots the cabbie. Sherlock questions the dying cabbie about the identity of his "fan", the cabbie's sponsor, and finally, under duress, he reveals a name: "Moriarty". The police arrive and Sherlock starts deducing facts about the shooter's identity, before realising it must be John and telling Lestrade to ignore everything he said. Sherlock and John leave the scene and run into the man who had abducted John earlier. He turns out to be Sherlock's elder brother, Mycroft (Mark Gatiss); John now understands Mycroft tried to bribe him out of genuine concern for Sherlock. Mycroft then instructs his secretary Anthea (Lisa McAllister) to increase their surveillance status. The episode is loosely based on A Study in Scarlet and contains allusions to other works by Arthur Conan Doyle. Moffat said of "A Study in Pink" and A Study in Scarlet: "there are many elements of the story, and the broad shape of it, but we mess around with it a lot". Tom Sutcliffe of The Independent points out, "Fans will recognise at once that the close-reading Sherlock applies to John's mobile phone is drawn from an almost identical analysis of a pocket watch [taken from The Sign of the Four]. More slyly oblique is the conversion of the lost ring that Holmes uses to lure the killer in A Study in Scarlet into a lost 'ring', a mobile phone that can be used to contact the killer directly." The episode also uses an identical clue to the original story, but gives it a different meaning: both stories feature "Rache" written at the scene of the crime. In the original story, Holmes dismisses a suggestion that the victim was trying to write "Rachel", instead pointing out that "Rache" is German for "Revenge". In this version Holmes's interpretation is reversed; he scoffs at the "Revenge" explanation and suggests the victim was trying to write "Rachel". The "three patch problem" that Sherlock describes is similar to the term "three pipe problem" he uses in "The Adventure of the Red-Headed League". The mention by Mrs. Hudson of "Mrs. Turner who lives next door" is a reference to a point in "A Scandal in Bohemia", where Holmes' landlady is once named as Mrs. Turner, instead of as Mrs. Hudson. The feverish shout of "the game, Mrs. Hudson, is on!" is a reference to a line in "The Adventure of the Abbey Grange", "the game is afoot", which is frequently accredited to Holmes in adaptations. In the 2013 mini-episode "Many Happy Returns", a newspaper headline tantalisingly reads "The game is back on" as a harbinger of the character's imminent return. The cabbie is dying of a brain aneurysm, while the murderer in A Study in Scarlet is dying of an aortic aneurysm. John's reference in the final scene to having been shot in the shoulder (but developing a psychosomatic limp in the leg) is an allusion to a continuity error in the Conan Doyle stories: in the original A Study in Scarlet Watson's injury is said to be in his shoulder, but in Conan Doyle's later Holmes stories, it is said to be in his leg. The second murder victim's name is James Phillimore, a reference to a case Holmes failed to solve in "The Problem of Thor Bridge". The text messages Sherlock sends John are taken nearly word for word from a telegram Holmes sends Watson in "The Adventure of the Creeping Man". The character Angelo, whom Sherlock saved from a murder charge by proving to the police that he was on the other side of London housebreaking, is a clear reference to a minor character in the 1946 Sherlock Holmes film Dressed to Kill, whom Holmes similarly helped by proving he was elsewhere in London blowing open a safe. 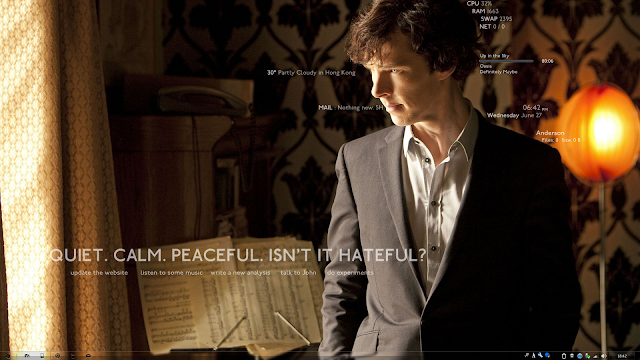 The case Sherlock is working on when he meets John involves a guilty brother with a green ladder. This is an apparent reference to an unfinished story found after Conan Doyle's death since completed as "The Adventure of the Tall Man" and included (sometimes as only the original outline) in some editions of the Sherlock Holmes Apocrypha. it asks for a password what is it?